So, what is the status of Ukraine after the 'Revolution of Dignity'? Tadeuz Olszański sees a bad news, good news story. Corrupt politicians and oligarchs have undermined the quick modernization of the Ukrainian state, but the 'de-Sovietisation of public consciousness' has been profound and continues onward. The revolution, however, has revealed the profound social changes which have taken place over two decades of independence, mainly through generational change and the increasing de-Sovietisation of public consciousness. These changes were one of the factors that enabled the revolution; and the war in eastern Ukraine has contributed to their intensification, and widened the circle of people involved in the process of change. These changes are more difficult to describe than legislative activity or the work of the law enforcement bodies. It is a matter of transforming attitudes rather than ideas, of new perceptions of the Ukrainian citizen’s own life and his place in society. In part, this is the result of a new generation, raised in an independent state, finding its voice; in part an effect of globalisation, providing new technical tools which have had substantial effects on social behaviour, as well as new ideas and doctrines; and in part the war, a state of affairs which always accelerates social transformations. Which of these changes will prove permanent and which will prove ephemeral is an open question today. There is no doubt, however, that the generational transformation will continue. The Revolution of Dignity which took place at the end of 2013 and the beginning of 2014 has brought about much deeper social changes than the Orange Revolution of 2004. The main reason for this was its length, and hence the number of people involved and the degree to which they were involved; as well as the different attitude of the protestors and activists towards politicians, and also towards the use of violence. The Orange Revolution lasted less than three weeks (from the beginning of the protests to the decision to re-run the second round of the presidential elections); fewer than a million people participated in total, and the action was focused on Kyiv. Its aim was to force the recognition of Viktor Yushchenko’s electoral victory, and the protest actions were planned and led by politicians from his entourage. The primacy of the political order, and therefore the leadership of the politicians, was not contested. The protest ended with a political compromise which allowed the losing side to emerge without losing face. The Revolution of Dignity lasted for three months; at least 2-3 million people took part in it, not only in Kyiv and Lviv but also in many other cities. Its purpose was to initially force the government to sign the Association Agreement with the EU, and later to overthrow the regime of Viktor Yanukovych. The protest action was initiated by pro-European social groups, and the politicians, who were regarded with distrust, proved unable to take control over it. The revolution ended with the rejection of the compromise negotiated by the politicians, and total defeat for the government. The Orange Revolution was the work of organisations which had been preparing for several years to fight the regime of President Leonid Kuchma; after Yushchenko’s victory, these forces withdrew from public life (apart from the political parties which represented them). This movement lasted for too short a time to be able to beget new, meaningful organisations and structures. The Revolution of Dignity broke out spontaneously, without any advance preparation; during its course, however, a number of social organisations and initiatives arose which continued their activities after the end of the protests. The Maidan Self-Defence (which in 2004 was little more than an informal security group) became a paramilitary force, able to stand up to the militia’s special divisions; it later formed the basis for the groups of volunteer detachments which played a very important part in the first phase of the war in the Donbas. In 2004, both sides struggled to avoid violence, feared bloodshed, and avoided situations that could have turned peaceful protests into riots. In 2014, both sides were prepared for violence; the protesters’ ranks included members of paramilitary formations, and the police were given free rein to use brutality. The escalation of violence led to the massacre of demonstrators on 20 February, although it is worth noting that there were also fatalities on the government side. 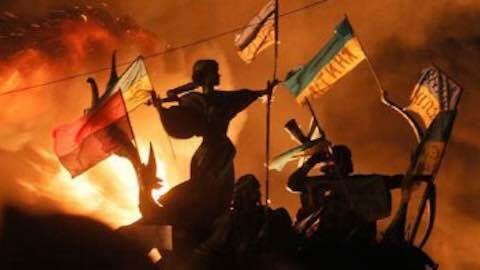 In the light of these considerations, it is important to state that the majority of the Maidan Self-Defence’s members and their opponents (the militants and the thugs supporting them, the so-called tytushki) belonged to the same generation, which had already been brought up in an independent country. Before 2013, as in the countries of Central Europe, volunteer groups in Ukraine had focused on various types of charitable activity (help for the very poor, the sick, and children) and environmental matters. According to available studies, in 2012 around 10% of the population were involved in volunteer work to a greater or lesser extent. This situation changed after the outbreak of war. As the state gave up defending the country (most strikingly in the case of Crimea), the burden of the fighting initially rested on a variety of volunteer formations which lacked any logistical support. Aid came from a quickly-formed volunteer movement made up of hundreds, if not thousands of small groups and centres, created in part on the basis of the previous support structures from the Maidan; there was never any single centre coordinating their activities. The volunteers supplied the fighters with literally every item they needed apart from arms and munitions: from food and underwear, through drugs and medicines, to helmets, bullet-proof vests and night-vision equipment. The volunteers also began to deliver aid to the regular troops (who were also badly equipped) as they joined the fight. This activity was mainly funded from various kinds of public collection. One way this was done involved volunteers and draftees from a particular town or village being sponsored by the public; the local authorities of that place also often participated. These activities fostered the reconstruction of local solidarity, which in many places had been disturbed in the previous period. The involvement of volunteer networks in taking care of refugees from Crimea and the territories affected by the war was of great importance. While the state treated their problems with bureaucratic indifference, the volunteers offered not only material assistance, but also mental and moral support, a sense of solidarity. In this way they contributed to ‘sewing together’ the war-torn country, something the authorities seem not to remember. As of mid-2015, more and more groups and volunteer organisations have undertaken aid programmes for demobilised fighters, who often find themselves in difficult living and mental conditions; in so doing, the volunteers are replacing the state in yet another area. The numbers of volunteers are hard to assess. In accordance with the studies already cited , during 2015 around 13% of the population of Ukraine (around 5.5 million people) undertook such activities. The largest percentage of volunteers came from the Ukraine-controlled part of the Donbas (19%) and the country’s western oblasts (14%). Achieving objectives related to the war and its consequences represented 65% of the volunteer groups’ activity, a further 12% involved giving aid to refugees, and 21% helping the sick and wounded (although it is not clear how this was measured). Up to 41% of respondents declared their financial support for volunteer activities (up from 21% in 2014). According to other studies  , the volunteer movement enjoys the greatest public confidence. The level of trust in volunteer groups (the difference between expressions of confidence and lack of confidence) stands at 44.1%, 40.4% for the Church , 13.5% for other social organisations, and 12.4% for the army (all other entities mentioned had a negative balance of trust, including the President [-48.1%], the government [-66.3%] and parliament [-72.4%]). Some volunteer groups have become important participants in social life on a national level, such as the Emergency Care Reform Package (Reanimatsiynyy paket reform, or RPR), which has drawn up and promoted a number of legislative projects (thus aiding the parliament and government in these tasks); and the Psychological Crisis Service, which now numbers around 500 specialists providing free psychological assistance to the families of soldiers and refugees, and which also trains social workers who may in future form the core of family mediation facilities. However, individual initiatives predominate; one example of these is the activity of Armen Shakharianets, a retiree living near Kyiv, who organised a collection of food for the troops, and so far has organised convoys to deliver more than 500 tons of it. In addition to the direct, measurable social effect, the volunteer work is important for another reason. Engaging in such activities is, on one hand, an expression of awareness that the state has not fulfilled its function, and on the other, of the will to replace the state. It is thus a result of the ‘de-statifying’ of public consciousness which has been ongoing since 1992: a weakening of the view that a person is and should be dependent on the state, which in turn is obliged to arrange a worthy life for him; at the same time, this ‘de-statifying’ favours the extinction of such a Soviet-era attitude. The ‘wartime’ volunteer movement has launched a potential for social ingenuity (innovation), and those who participate in it have, among other things, gained the experience of taking individual responsibility for the unexpected challenges they are confronted with. From the political point of view, it is important that the volunteers’ activities, both armed (soldiers) and civilian, have shown that the people can force the state and the authorities to do something without overthrowing it. Hence the growing pressure on the regional and central authorities, which often have non-legal forms and objectives (such as when a re-run of the mayoral elections in Kryviy Rih was forced). What did the municipal elections show? The local government elections in October 2015 were dominated by the main political parties, which were generally already represented in the regions and cities. Ukraine’s electoral law does not allow NGOs or civic initiatives to stand in elections. However, in some places, there were surprising successes for new forces originating outside the existing establishment, or (like the Samopomich party) which are not fully controlled by them. Here we examine the most prominent of these successes. The biggest surprise was the success of the People Power party, which was founded in 2014 and has 2600 members, and won a total of 211 councillors and 4 mayoralties in 32 towns around the country (generally smaller ones). This initiative, begun by a group of political scientists from Kyiv, and led by Oleksandr Solontay, a local government official from the Transcarpathian region, has built up its structures by co-opting local initiatives and social groups, and is aiming to represent the middle classes (i.e. young educated professionals). This party, based on the local ‘Together’ Initiative Group (which when the campaign began numbered only ten people) won 8.5% (about 10,000) votes in Mariupol, which gave it 5 seats out of 54 on the city council. Moreover, the party pushed all the parties of the current ruling camp off the council (the Opposition Bloc won, as expected; the third force in the council is now Our Country, a party made up of former members of the Party of Regions, which now supports Poroshenko). In another big city in eastern Ukraine, Kryviy Rih, People Power (based on the local Union of Responsible Citizens) won 6% (15,000) of the votes, four seats on the city council and 22 on district councils. Whereas these events are evidence of ongoing changes in social awareness, the case of Hlukhiv demonstrates the possibilities inherent in Ukrainian paternalism. In Hlukhiv, a neglected town in the Sumy region, the new mayor is Michel Tereshchenko, born in France, a descendant of a Hlukhiv-related family of Ukrainian entrepreneurs, lawyers and social activists. Tereshchenko has been running a company in Hlukhiv for some time, and after the Revolution of Dignity he concluded that he had to take power from the clan of Andriy Derkach (a local oligarch and politician with pro-Russian views). And Tereshchenko won, relying largely on ‘a whispering campaign’. A slightly different situation occurred during the election of the mayor of Kryviy Rih. Here the Samopomich candidate Yuri Myloboh lost – by only 752 (0.5%) votes – to Yuri Vilkul (the father of a Party of Regions activist and a former deputy prime minister, who at the same time lost the election to become mayor of Dnipropetrovsk). A measure of the changes that have occurred in Kryviy Rih is that his ‘Regional’ enemy could have run him so close, and even win in most constituencies (Vilkul had a clear win in only one district, which is de facto a separate city, and where voter turnout was suspiciously high). Myloboh’s supporters undertook a protest action, and after the courts rejected their complaints, convinced Samopomich to blackmail the Ukrainian parliament and force it to call new mayoral elections without invalidating the old ones, in a manner which at the very least is constitutionally doubtful. The new elections will be held on 27 March. A measure of the generational change, the most important social transformation to affect Ukraine since 1991, is the growing number of those which could be called ‘the independence generation’, i.e. those who started their school education in sovereign Ukraine (born in and after 1984). According to calculations by the Rating sociological research centre, in 2015 among adult residents of Ukraine, the group within the age range of 18-35 years old (i.e. born between 1980-1995) made up 34% of the population, or around 13 million people; removing those born between 1980-1983 (who were also mainly educated after 1991) we get a figure of 11 million, or one-third of the country’s adult population. Their numbers and their participation in society will rise from year to year as successive generations of the young enter adult life. This group, which is still too young to aim for power in the country, is free of the Soviet heritage, and did not undergo the methods of indoctrination associated with that period, including military service. Independent Ukraine is the obvious reference point for them. This is also a group much more open to the world: they use modern information technologies, they know English, and often have experience of work in the EU countries (although representatives of the median generation are also very numerous among the latter). Its urban part is focused on a ‘European’ style and way of life, and for the most part shares a liberal worldview, albeit with a very strong admixture of patriotic values. However, the far-right element is also increasingly following the patterns coming from the West. Social mobility has been fostered by the economic crisis (especially deindustrialisation), combined with opening up to the trend towards globalisation. Marketing and advertising companies (in particular the IT industry) developing in the cities encourage openness, flexibility, and the abandonment of Soviet cultural and social patterns. Out of necessity, programmers and marketers find themselves in the centre of the modern world wherever they live. It is no coincidence that a great many of the participants in the Maidan’s ‘permanent staff’ in 2014 worked in this sector. According to available data, this process has only covered the east of Ukraine to a small degree (perhaps apart from Dnipropetrovsk), where the mental model of manual labour and bureaucratic work still predominates. However, the change in the attitudes and views of the Ukrainian people will not be limited to the coming generation. Up until the collapse of the Soviet Union, nearly all its citizens were completely dependent on the state; they accepted this situation in principle, and expected that the state would guarantee them prosperity and security (both social and public). After its demise, the people had to deal with a reality in which the state had ceased to meet their obligations, and the new ideological narration rewarded examples of individual success. In Ukraine, the extent to which people had to ‘get by’ in the face of the collapse of the ‘old’ and the faults of the ‘new’ was enormous: small trading, working abroad, creating communities of inhabitants, local self-defence units (especially by holders of agricultural allotments), etc. These initiatives not only met the basic needs of living, but also changed individual and social awareness. Their success proved that the individual does not need to be the property of the state; that one could be an citizen independent of that state, both materially and morally; and that one could organise one’s life for oneself, not only on the domestic level, but also socially. Not everyone accepted this transformation (especially the oldest generation, which felt that the end of the Soviet system was an injustice), but it applied to everyone – even the workers in heavy industry, albeit to the least extent. So the new Ukrainian society is being born; but the process is still not finished. An important component of the new social awareness is individualism, which contrasts with the collectivism of the Soviet period (ideological) and that of heavy industry (which was required by the nature of the work of the great industrial enterprises). Also, in a startling way, this new civic awareness is well in keeping with the traditional Ukrainian ‘anarcho-democracy’, whose roots can be traced back to the Cossack period, and examples of which are perpetuated in classic and contemporary historical literature. Both of these have been evident in the course of the Revolution of Dignity, as well as during the war: on the one hand, spontaneous, polycentric self-organisation, and on the other, a reluctance to submit to discipline or create a hierarchically-led organisation based on long-term activity. The positive programme of the Revolution of Dignity – a radical modernisation of the state by cleansing it of corruption (and of the corrupt), as well as the modernisation of the legal system – has not brought about the desired result; its implementation is impossible at present, without a new, strong social impetus. The revolution has brought new people to power, but no new political environment. Before 2014, the vast majority of Ukraine’s current leaders were second- or third-level members of the political and economic establishment. The collapse of the most desired reform, namely the fight against corruption, is causing growing frustration, as is the year-long state of ‘neither war nor peace’ in the east, and the sense that the constant stream of new victims have suffered for nothing. For now, the Ukrainian people have not shown any readiness to hold new protests, and the sense of the revolution’s failure has not led them to risk creating new victims. However society is much better organised now, thanks to the existence of the volunteer networks, even though they are currently inactive. The public has also become much better armed; in a country where there were always many hunting weapons and small arms in private hands, a large amount of military weapons have come into civilian hands over the past two years. The country has also gained a considerable number of young people who have not only received military training, but who have also had combat experience, and learned the courage that flows from it. In this situation, there is a high risk that new public protests (if they occur) would be accompanied from the beginning by large-scale violence, the more so as both the overthrow of the Yanukovych regime and the rejection of the compromise negotiated by the politicians made the public aware that the use of force can bring results. Some even fear the outbreak of a civil war and an anarchic atamanshchyna (uncoordinated military-political activity) which could threaten the survival of the state. The latter fears seem exaggerated, but they are a factor in policy decisions, including those taken by the government. The risk of such protests breaking out is associated above all with the possibility of the armed conflict in the Donets Basin ending in a way unfavourable for Kyiv. Recognition by the central Ukrainian government of the separatist republics’ formal autonomy would produce not only deep public opposition, but also the threat of rebellion by armed volunteer formations who would feel they had been betrayed, not defeated (the ‘stab in the back’ syndrome). It seems that Kyiv is aware of this risk: hence the 2015 merger of most of the volunteer formations with the state’s armed forces; hence also the ongoing state of ‘neither war nor peace’, and the avoidance of any actions that could be considered as ‘capitulation’. Some of the spontaneously-organised armed formations, militias of radical political parties and veterans groups are associated with individual oligarchs and politicians. In the case of a final split within the ruling elite in Kyiv, some of these groups may be tempted to use them (such precedents, in the form of paramilitary activities in obscure political interests, have already been set). Such a turn of events would genuinely threaten the possibility of civil war. On the other hand, among social elites not linked to the establishment, demands for radicalism are rising. One sign of this is a recent article by the social philosopher and so-called opinion-former Serhiy Datsiuk, entitled ‘The danger of avoiding revolution and war’ , in which he writes directly that civil war may be one of the only possible (and permissible!) ways to get out of the current crisis: “a new Maidan in the form of a civil war, during which some of the ruling layer will be physically destroyed, and the rest forced to immerse themselves in the common existence of the public, including the experience of losing relatives and loved ones, of poverty, of insecurity about the future.” In a society which has been pauperised, disappointed in its hopes, mourning its dead, such suggestions may have a broad appeal. A complete description of the social transformations taking place in Ukraine is impossible; there are too many initiatives, trends and organisations, and their dynamics are too fast and still too incomplete to fully grasp. The unstable situation in the country, as well as the general acceleration of change worldwide, makes it difficult to predict which will prove long-lasting and which purely ephemeral (which does not mean that the latter are unimportant). The only undoubtedly permanent and irreversible transformation is that of the generational factor; however, the trends towards modernisation and pro-Western attitudes among the young generation could be threatened by increasing emigration after the European Union abolishes its visa requirement. The extent to which the transformation of society initiated during the Revolution of Dignity, bringing Ukraine up to European notions of civil society, will be consolidated depends to a large extent on the implementation of at least some of the reforms (which will depend on those governing the state, as well as on how the conflict in the east of the country is resolved). Implementing the planned local government reform and reducing corruption will be conducive to the growth of social activity, the sense of responsibility for one’s own town or neighbourhood, and may also contribute to the containment of migration trends (not only foreign emigration, but also escape from the villages and smaller towns to the big cities). The failure or neglect of these actions will cause disappointment, which may lead not to new protests (although this is not impossible), but to the recurrence of apathy. The development of new policy initiatives would be hindered by early general elections, which would most likely only lead to a reshuffle within the current party system. The new political forces are still too weak, organisationally, programmatically and financially, to effectively fight for a position in parliament which would give them real influence over its work. From their point of view, it would be better if the elections were held at the constitutionally appointed time, in the autumn of 2019. The way in which the Donbas conflict is resolved will be much more important, especially as a huge part of the new social initiatives are involved with it in one way or another. If the current state of ‘neither war nor peace’ goes on, this will favour the continuation of volunteer activities (aid to the military and the veterans is still needed) and the consolidation of the civic movements which see the need to either support or replace the state. The resumption of large-scale armed hostilities (however unlikely at the moment) would give impetus to these initiatives, and would also focus people around the state. However, any political solution leading to the de facto recognition of the breakaway areas’ independence within the Ukrainian state would, on the one hand, produce violent protests which could threaten the state; and on the other, a widespread collapse of social activity, a recurrence of apathy and an increase in emigration. Data from sociological research: Народні помічники: портрет українського волонтера, 4 January 2016. Information from the Kyiv International Sociology Institute, based on research from December 2015. It is hard to consider the answers to this question as reliable, since Ukraine does not have a single dominant religion, and respondents were able to declare their confidence in various religious structures (just as they could in various politically-oriented structures). It is often maintained that had it not been for the armed struggle by the voluntary formations, the government in Kyiv would not have undertaken any active defence of the eastern oblasts. http://ratinggroup.ua/research/ukraine/dinamika_obschestvenno-politicheskih_nastroeniy_v_ukraine.html, accessed 12 January 2016. In data from the State Statistics Committee of Ukraine, at the beginning of 2014 Ukraine had 45.2 million inhabitants, including 8 million aged under 18 and 6.9 million older than 65. The number of inhabitants on 1 December 2015 was 42.8 million; the difference is due to the deduction of the population of Crimea, among other factors. Here we may mention the first and most important Ukrainian historical novel, The Black Council [Чорна рада] by Panteleimon Kulish, as well as Gogol’s Taras Bulba [Тарас Бульба], which is considered to belong to ‘native’ – although, as it was written in Russian, not necessarily ‘Ukrainian’ – literature; as well as the contemporary novel Black Crow [Залишенець. Чорний ворон] by Vasyl Shkliar, which deals with the fight of the anti-Soviet insurgents from 1919-1922. In Ukrainian historiography, the ‘Atamanshchyna’ (Ukr. отаманщина, Ru. атаманщина) refers to the anti-Soviet insurgent movements in the years 1919-1922, which were unable to create a central headquarters or a political leadership. The fact that this is a realistic possibility was proved during a demonstration against the amendment of the constitution on 31 August 2015, during which a Freedom Party thug threw a grenade at a police cordon, killing three people and injuring at least a dozen. Further evidence is the spontaneous action by members of paramilitary organisations in February 2016 to stop Russian goods trucks travelling through Ukraine, in advance of an official ban. "Ukraine: Two Years After the Revolution"